It's cabbage season, so I wanted to feature another recipe featuring the beautiful Napa cabbage that has been showing up at the markets. This time, Asian inspired, after all, Napa cabbage is of Chinese origin; seemed only natural. Today, Hoisin Pork with Napa Cabbage, from Fine Cooking. The pork tenderloin was from Lindenhof Farm, and was tender and flavorful. This is a straight forward stir fry. Prep all of your ingredients ahead of time, then get your wok hot (or large saute pan), and you'll be finished in a snap! About that red pepper - arghhh - I know it's out of season, not available locally, not this time of year. I'm so embarrassed to admit this. I bought one at the grocery - I feel dirty! And, to make matters worse - not only was this organic red pepper which I purchased not local, it wasn't even "domestic" - not even from the good old U.S. of A. This pepper was imported from, wait for it, Israel, over 5800 miles from home. Imagine my horror when I got home, put my specs on and read the label! I have so broken my "eating local" pledge. To all my local farmers - I apologize! It won't happen again! This dish was delicious, and nutritious, at only 290 calories per serving! A note to sodium sensitive folks - this recipe is fairly high in sodium at nearly 1200 mg. per serving. 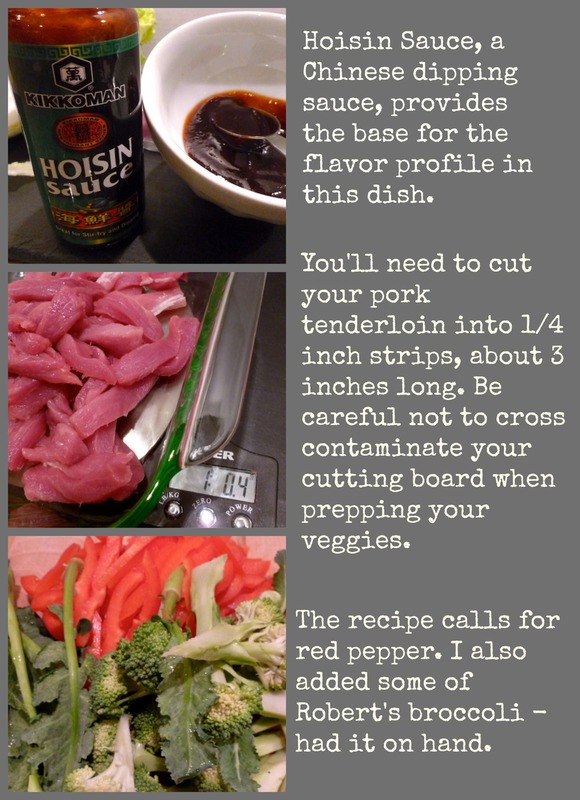 You can cut back on the sodium by using a reduced sodium soy sauce - I did, and it was perfect. The cabbage holds up nicely during stir frying. Remember, stir frying is a quick cooking process, a flash in the pan! That's why it's important to have all of your ingredients pre-prepped, and, to keep the heat high during cooking. I made a batch of brown rice to serve with the stir fry, it soaks up the sauce nicely. On the side - a chopped veggie salad with Trey's Radishes and Birgit's turnips, dressed with a lovely miso dressing. This is another great dressing, coming in at less than 60 calories per tablespoon! All I was missing was the fortune cookie!